The other day, we talked a bit about what the first quarter of 2019 could tell us about the rest of the year, but it provided only a high-level look. To help us understand what is going on as we approach the second quarter, today I want to dig deeper to evaluate what happened and why. It was a great quarter, with markets up around the world. Here in the U.S., the major indices were up between 11 percent and 17 percent, with the Nasdaq leading and with the Dow trailing due to Boeing. Abroad, both developed and emerging markets were up just under 10 percent. Even fixed income did well, as interest rates dropped on the Fed’s shift to a more relaxed stance on monetary policy, signaling few if any more rate increases this year. From an investing perspective, this was a really good quarter. But this positive picture was kind of strange. Why? From an economic standpoint, it wasn’t ugly, but it certainly wasn’t good. We saw slowdowns in job growth, in consumer and business confidence, and in spending growth. Corporate earnings expectations were revised down at the fastest rate in years. Political headwinds continued to build, both here and internationally. It was a tough quarter for the fundamentals. In a word: valuations. Based on expected earnings over the coming year, in the last quarter of 2018, stock valuations dropped down to the lowest level we have seen since 2013. As such, stocks became (by recent standards) cheap. In that sense, the rebound this past quarter was simply the market going from cheap to fairly priced. There was also a tailwind from interest rates. As rates drop, stocks are seen as being worth more. Further, the bad news that drove down stock values—trade wars, the government shutdown, fear of the Fed, Brexit, and others—all pulled back during the quarter. Combine these ingredients, and we had a recipe for a bounce back that has taken us back close to all-time highs. This look back also gives us a lens for what we need to watch going into the next quarter. Is the economic data recovering? This morning’s reasonably strong jobs report suggests it is, along with stronger confidence and spending figures. More, over the past several years, first quarters have been weak only to rebound strongly for the second quarter. That could well be the case again. Will interest rates rise again? Probably not, with the new Fed stance. Will we see more worrying political news? Quite possibly, but Brexit seems to be turning from tragedy into farce, and Washington appears to be closing in on a trade deal. The two unfinished pieces of news from the first quarter are the real risks. First, as of the start of March, the U.S. government ran out of money again as the debt ceiling came back into force. This is a pending issue that could take us back into a shutdown, or even somewhere worse. Second, stock valuations are now at fair levels, without the rubber band effect that helped pull them higher in the first quarter. Looking back at the first quarter, the mix of strong markets and weak economic data is not likely to fully reverse, but it may at least moderate. 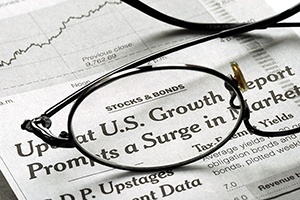 We can expect market growth to continue, but more slowly, and economic data to improve. Overall, it is not a bad place to be.